Krispy Kreme FacebookKrispy Kreme is celebrating National Doughnut Day. 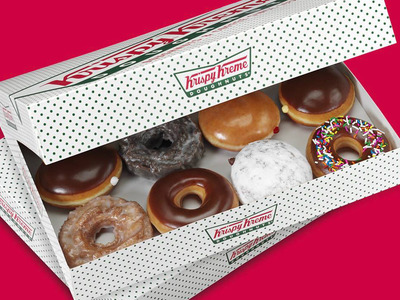 Krispy Kreme is giving away free doughnuts on Friday for National Doughnut Day. Other brands giving away doughnuts include Dunkin’ Doughnuts and Walmart. National Doughnut Day is celebrated on the first Friday of June every year. Krispy Kreme is giving away free doughnuts on Friday, June 1. The chain is doling out free treats for National Doughnut Day. There are no strings attached and no additional purchase necessary – just one free doughnut of the flavour of customers’ choosing to celebrate the holiday. Krispy Kreme has a list of all locations that are participating in the doughnut giveaway on its website. Krispy Kreme is not the only chain offering National Doughnut Day deals in 2018. Dunkin’ Doughnuts is giving away a free doughnut with the purchase of any beverage on Friday. Even Walmart is getting in on the action, with free glazed doughnuts at every location in the United States. While food holidays have exploded in popularity in recent years and now dominate the American calendar, National Doughnut Day has a longer history than most other culinary celebrations. The first National Doughnut Day was held in 1938, as a tribute to The Salvation Army’s “Doughnut Lassies” who helped support the troops during World War I. “After discovering that serving baked goods would be difficult considering the conditions of the huts and the limited rations, two volunteers – Ensign Margaret Sheldon and Adjutant Helen Purviance – began frying doughnuts in soldiers’ helmets,” according to an article on The Salvation Army’s website. National Doughnut Day is celebrated on the first Friday in June every year.